Falling in the often overlooked “shoulder season,” visiting Alaska in September is one of the best kept secrets around…so, shhhh. From eye-popping color shows to northern lights displays and rare fishing opportunities, read on to find out the top reasons Alaska should make your travel itinerary this fall. Best of all? You just might have the place to yourself. More than 1 million visitors make the expedition to Alaska each year, but of that large number, the vast majority of people stick to the peak summer months of June, July, and August. Fewer people means more accommodations are available in popular areas like Denali National Park, and that in general, you’ll be hiking, sightseeing, and snapping photos with waayyy fewer photobombers. In an already vast, sparsely-populated state, that means an unforgettable sense of communion with the outdoors. While many states in the Lower 48 drag their heels on the fall colors display, Alaska begins its multi-layered festival of colors around Labor Day. What does this mean for September visitors? Hardwood trees in a plethora of different shades from the brilliant yellow and orange of aspens and willow trees to low plants of the tundra in a deep crimson. Around this time of year, Denali National Park’s Polychrome Pass really earns its keep, and the contrast with the snow-capped peaks in the background will have you reaching for your camera in awe, even while you’re safely out of the snow yourself. 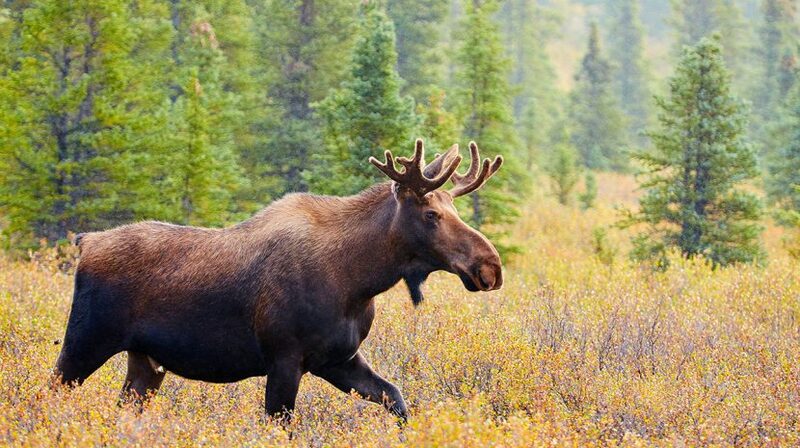 In preparation for the snowbound winters, large mammals such as caribou, moose, and grizzly bears venture into lower elevations in order to capitalize on a last-minute weight-gain buffet. If you’re an animal enthusiast, this combined with the lack of crowds means that your chances for spotting and observing these large game animals in their native habitat will drastically improve…just be sure to enjoy them from a distance! Go to the weather calculator and plug in your home city. You may be surprised by the weather comparisons you see between the average September temperatures in Alaska and the average temperatures at home. In general, early autumn in Alaska means warm days and colder nights, so you can sight see in the sun, and then bundle up for our next suggestion in the evening. On a clear night in September, the elusive and just-a-tad mystical aurora borealis can often be spotted in Alaska. Just head outdoors between the hours of 10 p.m. and 2 a.m. and point your nose skyward. The most reliable area to catch them is around Fairbanks, or further to the north and inland. This area is known as the “aurora oval.” The Fairbanks Princess Riverside Lodge will even give you a complimentary wake-up call. As the tourist season winds to its spectacular close, many hotels and tour companies drop prices significantly in order to keep their rosters full. Take advantage of this by researching deals ahead of time – you may be able to obtain discounted tour rates or add an additional traveler to your party for little or no cost. For example, the Denali Princess Wilderness Lodge drops its room prices by a full $100 as soon as September rolls around. With lowered flight and room rates, you can stretch your sightseeing dollars that much further. It’s pretty hard even for novice fishermen not to take home a fish during Alaska’s long and prolific fishing season. September is no exception. The late silver salmon run keeps the Kenai River flipping, and Sitka’s fishing on the Pacific Ocean means you might get the chance to reel in a heavyweight as hefty as 126 pounds! With its northern location and sun-friendly time zone, Alaska actually enjoys an average of 10-17 more minutes of daylight per day than the rest of the country, plus brighter light preceding sunrise and sunset. Alaska may be infamous for dark winters, but for the months before and after summer, the long days will have you out maximizing your recreation time while the rest of the country is getting ready to turn in. Alaska is home to 35 different species of mosquito, and not one of them is welcomed by the visitors to our many stunning parks, rivers, and mountains. September, however, is perfect for those who prefer bug-free travel. After their busy season during June and July, the majority of mosquitoes die off, which means visitors in the autumn can breathe just a little bit easier (and worry less about repellents) while out enjoying hiking and boating adventures. Livestock, live concerts, fireworks, all-ages activities…what’s not to like? Excited about visiting Alaska in September? Ready to visit during one of the most beautiful times of year while saving money? Search our Princess Lodges deals and specials today to find your perfect autumn vacation. Browse our exciting tours and book your fall adventure today!